Jorge E. Hurtado was born in Cali, Colombia. He grew up in Corona, Queens, New York in the 70s and has been a resident of Broward County for 31 years. Mr. Hurtado has resided in the City of Parkland for the past 16 years with his wife of 28 years, Valerie, and his three children Joshua, Natalia and Angela all of whom are his priority. He studied at the City College of New York, Bob Jones University, Clemson University, and earned his Juris Doctor degree from the University of Miami School of Law. Mr. Hurtado has been a licensed attorney in good standing of the Florida Bar and the Federal Bar since 1990 and has been admitted to practice in all the State Courts of Florida, the United Sates District Courts for the Southern District of Florida, Eastern District of Michigan, and the United States Court of Appeals Eleventh Circuit. Mr. Hurtado practices both in state and federal courts and has handled cases in the areas of general civil litigation, family law litigation, bankruptcy and commercial litigation, and criminal defense during the past 21 years. Mr. Hurtado has personally handled over 100 bench and jury trials to verdict, and has handled appeals in the Fifth, Fourth and Third District Courts of Appeal in Florida. 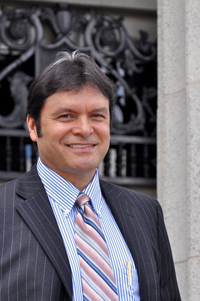 Recently, Jorge E. Hurtado has been nominated by the 17th Circuit Judicial Nominating Commission in Broward County, Florida as a qualified candidate for County Court Judge and for Circuit Court Judge as he has been selected several times among several fine finalists that have been sent to the Governor in Tallahassee for judicial appointment. Mr. Hurtado is involved in various numerous boards and committees, including the 17th Circuit Pro Bono Committee, of which he is Chair. Mr. Hurtado has been a member of the American Bar Association, The Florida Bar Family Law and Criminal Law Divisions, Broward Association of Criminal Defense Lawyers, Florida Association of Criminal Defense Lawyers, Broward County Bar Association, Broward County Hispanic Bar Association, the Colombian Bar association and the Federal Bar Association Broward Chapter. Jorge E. Hurtado can be contacted at 954.341.2230 for any legal question.